It may seem hard to believe, but approximately 80% of American adults and adolescents are insufficiently active. Appropriate physical activity can make such an impact on how you feel and how you function. It also reduces the risk for many chronic diseases. 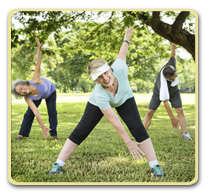 This week, new physical activity guidelines were released. This seems like the perfect topic for our Health Tip! For the first time, the guidelines actually include recommendations for children younger than 6. The recommendation is that these children should be physically active throughout the day. Adult caregivers should encourage active play that includes a variety of activity types. A specific quantity of activity is not well defined for this age group in the guidelines, but a reasonable target would be at least 3 hours per day of physical activity (including light, moderate, and vigorous level of intensity). Physical activity can enhance growth and development and teach important movement skills for this age group. Parents and caregivers do play a critical role in supporting and encouraging children of this age to be physically active, including by simply showing children that you are physically active. Children in this age group should have at least 60 minutes or more of moderate-to-vigorous physical activity daily. Most of this should be aerobic activity. Muscle strengthening should be part of this 60 minutes at least 3 days a week. Bone strengthening activity on at least 3 days a week as well. It is important for young people to have opportunities and encouragement to participate in physical activities that are appropriate for their age, that are enjoyable, and activities that offer variety. This is a critical time for developing not only important physical movement skills, but also for developing healthy physical activity habits. This can establish a firm foundation for lifelong health and well-being. Parents and caregivers still have a crucial role in supporting and encouraging physical activity in children at this age. This again includes modeling a physically active lifestyle for them. Young people who are regularly active have a better chance of a healthy adulthood, by lowering risk factors such as obesity during these years, and also developing the habits to help keep that risk low. Adults should do at least 150 to 300 minutes of moderate intensity physical activity per week, or 75 to 150 minutes of vigorous intensity aerobic physical activity per week, or an equivalent combination. Adults should also do muscle strengthening activities of moderate or greater intensity that involve all major muscle groups on 2 or more days a week, as these provide additional health benefits. Preferably, the aerobic activities should be spread throughout the week. Additional health benefits are gained by doing more than the recommended amount of exercise. Adults should move more and sit less throughout the day. Some physical activity is better than none, and adults who sit less and do any amount of moderate-to-vigorous activity do gain some health benefits. The activity should include some balance training. Their level of fitness should determine their level of effort. They should understand how their chronic medical conditions impact their ability to do physical activity safely. If they cannot do 150 minutes of moderate intensity activity per week, due to chronic health conditions, they should be as active as possible. Keep in mind that things like raking leaves, carrying heavy groceries, doing heavy housework, and a brisk walk (2.5-4 miles per hour) can all be included in the activity that you count. Just don’t include things that are not at least moderate intensity.